The town of Parkes in central New South Wales has a population of around ten thousand. But, every January, this number doubles thanks to the Parkes Elvis Festival – one of the world’s largest Elvis Presley tribute festivals. It started in 1993 and has been growing steadily ever since. I’ve always found it strange that it took place in Parkes, of all places, and decided to attend this year. While it isn’t new, it is still one of the largest examples in size of celebrity idolization throughout the world. Elvis idolization is not hard to find and comes in many forms, but it goes beyond mere honor and respect: Elvis impersonators are a cultural phenomenon. Imitation is commonly understood as the greatest form of admiration, but this is usually in regard to manners or work ethic. So, what benefit is there to imitating people like Elvis? There are people for whom it is a job, and it’s even possible to imitate him for the sake of a criminal ploy, as the film 3000 Miles to Graceland suggests. But, what about people at the festival like those depicted below? What’s in it for them? We might consider this imitation, which manifests in festival events such as look-a-like and sound-a-like competitions, among others, as a form of “celebrity worship.” If so, then it’s pretty clear that there’s some sort of engagement taking place between this popular cultural icon and mainstream forms of religiosity. In Authentic Fakes: Religion and American Popular Culture, David Chidester examines how popular culture might work in “characteristically religious ways.” For him, these “religious ways” of being in the world are marked by an engagement with the transcendent (“that which rises above and beyond the ordinary”), the sacred (“that which is set apart from the ordinary”), and the ultimate (“that which defines the final, unavoidable limit of all our ordinary concerns”).1 And while popular culture seems to only deal with the ordinary, this doesn’t always appear to be the case. In celebrity worship, certain individuals and their image are produced and circulated in society and are made to appear superhuman, transcending the mundane, obtaining a mild sacredness, and becoming a conduit for our ultimate concerns. 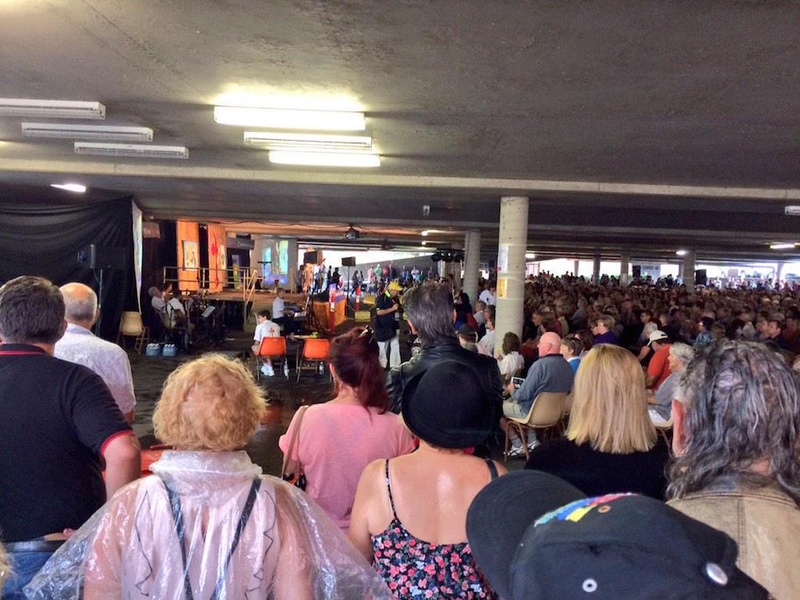 Elvis, along with many other celebrity figures, provides a sense of meaning, identity, and community for impersonators and festival attendees, and it’s evident that people attending the Parkes festival feel that Elvis is greater than the average human, even if he wasn’t supernatural. This phenomenon also brings to mind a fascinating, though contested, psychiatric term: the Jerusalem Syndrome. Those affected often have delusions and obsessive ideas when they visit Jerusalem, and in extreme forms, believe that they are actual historic or religious figures. Though people pretending to be Elvis are not exactly the same as people believing that they’re biblical figures (and possibly never returning to their previous, everyday lives), perhaps we can refer to the phenomenon as the Elvis Syndrome, since certain similarities between them do exist: the people at the festival come from all walks of life, they dress as their idols (there are some Priscilla Presley impersonators, too), and don’t mind what other people think. The festival creates a space where people are able to do this, much like how Jerusalem is a place that enables its syndrome to occur. But, how should we respond to this Elvis Syndrome, and more broadly, the adoration and idolization of other celebrities and entertainment figures? There’s always the fear and possibility that such sentiments might be received offensively – especially if the term “idol” is taken literally. The controversial Westboro Baptist Church picketing at Graceland in 2013, decrying that Elvis is in hell for using drugs and spreading (even in death) a sinful message to the world, is such an instance. Of course, this is an extreme example, but if one believes that people like Elvis are literally idols and that idols are sinful and should be opposed, it is a reasonable position that some might take. A more understandable way of looking at this sort of phenomenon would be to recognize that in contemporary society and culture, religious expressions exist sometimes in unconscious or unrecognized ways. Recognizing this is not necessarily a question of whether it is a good or a bad thing but accepting that religions, religious expressions, and cultures are always in flux, changing, and hybridizing. Another way to look at it is to ask how religion still features in public life when a significant part of traditional religious culture and dominance, according to some sources, appears to be waning; e.g., the increase in “no religion” responses on Australian census forms (and in other countries as well), and the commercialization of certain holidays worldwide, such as Christmas and Easter. When the content of contemporary culture is far more secular, will some people interact with it as if there is a religious dimension to it? Perhaps Elvis and his impersonators provide us with the perfect example to examine this possibility. This ability for hybridization really became apparent to me on the final day of the festival: an interdenominational Sunday morning Elvis Gospel Service paying tribute to Elvis’s love of gospel music with a professional Elvis impersonator leading the congregation in singing, all in an average, nondescript department store’s undercover carpark. Can you deny that this raises questions about religion, celebrity worship, and how people find meaning in their lives? Other than gospel music influencing him when he was young, it’s not as if Elvis has had a historical theological importance in Christianity, so what is going on here exactly? Is Pete Ward correct in Gods Behaving Badly: Media, Religion, and Celebrity Culture that for some people, Elvis functions as a kind of intercessory in their worship – a substitute Christ who is more easily relatable, who existed within the realm of living memory, and achieved so much despite all his faults made public? Are those who were “great” humans actually greater than other humans, making them more apt for such veneration? For whom are the people at the service there: Elvis or Jesus? Maybe it’s not so clear, but maybe these are the reasons why people idolize celebrities. 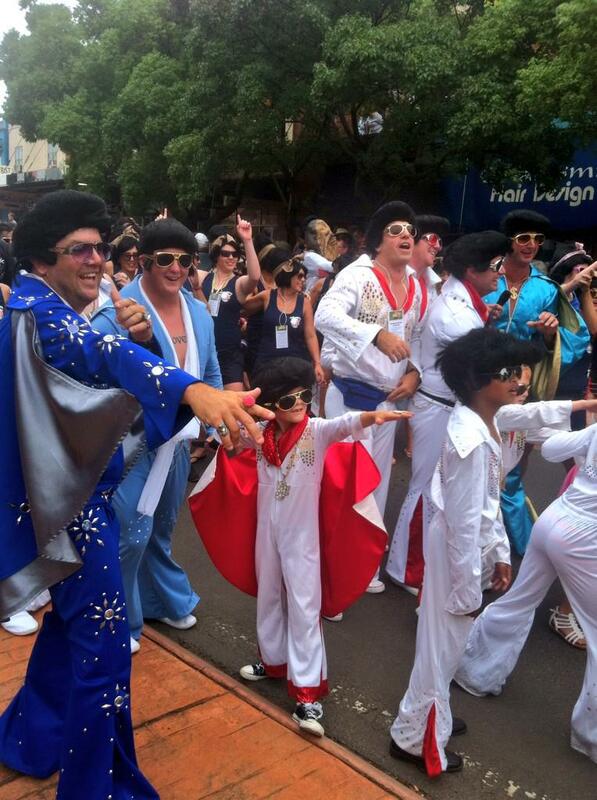 Photographs courtesy of the Parkes Elvis Festival official Twitter account: @ParkesElvisFest.